Dog Jaunt applauds all efforts to allow restaurants the option of offering dog-friendly dining areas, so I’m happy to tell you about these two links. Ohmidog! reported this week that a bill currently before the Maryland General Assembly would move Frederick County, MD one step closer to allowing restaurants to welcome dogs in outdoor dining areas. The Knoxville, TN city council is a step ahead, and a post from Mountain Mutt Photography showcases The French Market’s dog-friendly patio (with lots of pictures of four-legged patrons as well as restaurant owner Allen Tate). Across the pond, London’s Coopers Arms pub (in Chelsea) is dog-friendly, reports Context. Looking for other dog-friendly pubs in England, Scotland and Wales? Check out the Doggie Pubs and Winalot listings. Carmel, CA is known as a dog-friendly town, but this post from the Contra Costa Times provides particularly good details and suggestions for a visit, along with heaps of photos of poodle-mix Misty and poodle Daisy. Other vacation options? And a Small Dog reports favorably about the only dog-friendly all-inclusive resort author Leila Coe has found: the Xpu-Ha Palace Resort, near Cancun, Mexico. Back in the States, Will My Dog Hate Me‘s Edie Jarolim posted Part 2 of her superb dog-friendly 36 Hours in Tucson, AZ, including a historic tour via the Presidio Trail and a steak & ribs restaurant. Keep in mind, however, that it’s still ski season at many places in the U.S. One article I found lists several dog-friendly places to stay in Breckenridge, CO (I don’t love the article, since it looks like it’s really meant to send you to a travel agent’s site, but the basic info might be helpful). Another post, from Travelin’ Jack’s Dog Blog, provides photos and information about dog-friendly snowshoeing at Enchanted Forest, located near Red River, NM. Check out Enchanted Forest’s site for more info; dog-friendly cross-country skiing is also available! Remember that a couple of weeks ago, Go Pet Friendly posted a proposed pet travel code of conduct? In a similar vein, Copywriter posted a list of tips for staying at pet-friendly vacation rentals — all sensible, and likely to make owners of vacation rental properties continue to welcome pets as guests. Two last fun links to tell you about — the first, Expatify.com‘s list of the “best urban beaches around the world,” mentions in a throwaway line that Tel Aviv’s Hilton Beach is dog-friendly, and the second is another great post from Honey the Great Dane, talking about Honey’s search for an excellent off-leash dog park in Brisbane. Lots of photos, as always, as well as some sensible thoughts about the hazards of dog parks and inattentive owners. I followed the discussion at http://www.gopetfriendlyblog.com. It was quite lively. 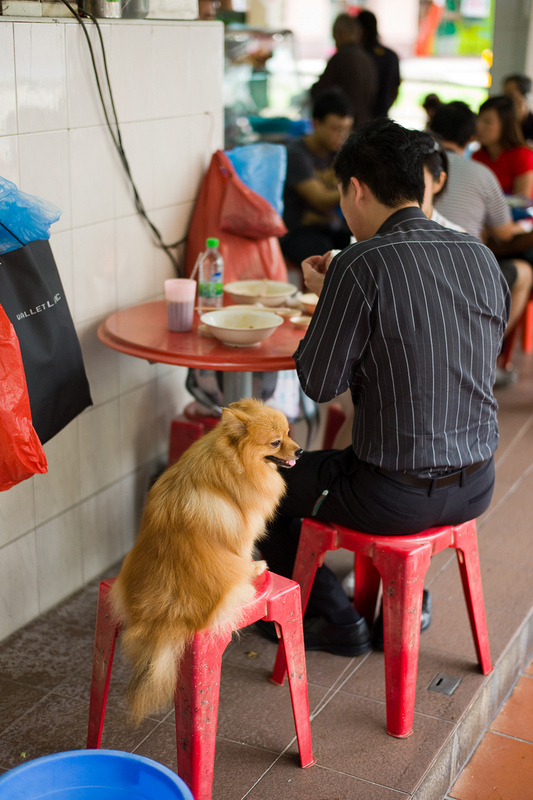 I agree that as long as a dog is well behaved, he should be allowed to go to a restaurant. I know I will sound cranky, but I hate it when children and adults are rude at restaurants. I’ve been eating out a lot lately because our kitchen is being renovated, and I’m surprised at the loud and unruly children and loud adults at nearby tables. I wish people would use their indoor voices. Thank you for the link! And I really appreciated the tips for staying with pets in vacation rentals – great info. These are exactly the kinds of things we need to think of if we want our pets to continue to be invited to join us! !